Celebrating Women's Voices, the Fund's 2017 fundraiser, was an incredible success! Our 2017 recipient of the Celebrating Women's Voices award was Marty Moss-Coane. For almost 30 years, Marty has been the host of WHYY's Radio Times. Board President Judy Buckman, in her introductory remarks, said, "Marty is far and away the best interviewer anywhere. In addition to her thoroughness, empathy and insight, I am in awe of her ability to follow her guest out on a tangent during a discussion, asking pertinent questions along the way, then bringing them back to the original starting point and picking up exactly where they left off to carry the conversation forward. That's more than a skill; that's a gift." Jenn Carvin, photographer (www.JennCarvinPhoto.com), Susan Stults Ewart (www.susanstultsewart.artspan.com), and Diane Wolff-Pastore, painter. 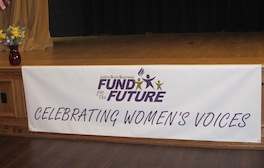 Celebrating Women's Voices, the Foundation's 2016 fundraiser, was a remarkable and thoroughly enjoyable occasion! Jenn Carvin, photographer (www.JennCarvinPhoto.com), Barry Pisetzner (pisetzner.com/), and Diane Wolff-Pastore, painter. Featured guest speaker, and recipient of the 2016 Celebrating Women's Voices award, was Sally Friedman. She did not disappoint! Sally's presentation was like her columns, straightforward and to the heart, and serious with a few zingers of humor. She touched on her experiences as a teacher, a wife and a mother. She explained the genesis of her becoming a writer, both in its unexpected aspect and in its glorious fruition. Through writing she discovered her life's passion for chronicling her family's important and mundane experiences and for reaching out to explore other people's experiences and how they felt and thought about their lives. Being able to read and re-read Sally's columns over the years has been a treat. Hearing her in person was a double treat! attendees and the generosity of those who donated raffle basket and silent auction items. The Board thanks all our donors and volunteers who helped with this event.